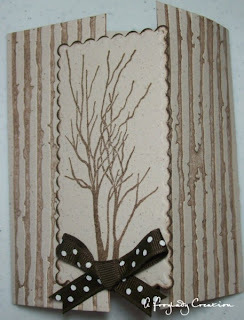 I made this card for a challenge on the PCP Cuttlebug group. 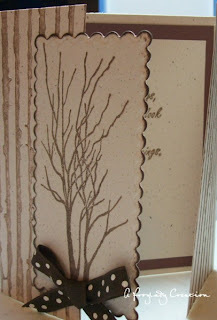 I liked the gate fold and how I was able to coordinate the Seaside Stampin Ink tree stamp with the Cuttlebug lines to resemble some bark...ok at least that was the look I was going for! The tree was cut out with my scalloped rectangle nesties and then I added the bow with ribbon from Really Reasoonable Ribbon. Ohhh these are pretty! Sounds like another challenge I need to try! :) TFS!!! Such a beautiful creation!! :) TFS!